The Baltimore Orioles are a professional baseball team based in Baltimore, Maryland in the United States. They are a member of the Eastern Division of Major League Baseball's American League. One of the American League's eight charter franchises in 1901, it spent its first year as a major league club in Milwaukee, Wisconsin, as the Milwaukee Brewers before moving to St. Louis to become the St. Louis Browns. After 52 mostly hapless years in St. Louis, the Browns moved to Baltimore in 1954 and adopted the Orioles name in honor of the official state bird of Maryland. The Orioles name had been used by previous major league baseball clubs in Baltimore, including the American League Baltimore Orioles franchise from 1901–1902 that became the New York Yankees and the National League Baltimore Orioles which won National League championships under Hall-of-Fame manager John McGraw, before McGraw took the black and orange team colors to the New York Giants baseball team, which became the San Francisco Giants after the 1957 season. Nicknames for the team include the O's and the Birds. The Orioles have been best known for their successful stadium, the trend-setting Oriole Park at Camden Yards, opened in 1992 near the birthplace of Babe Ruth. 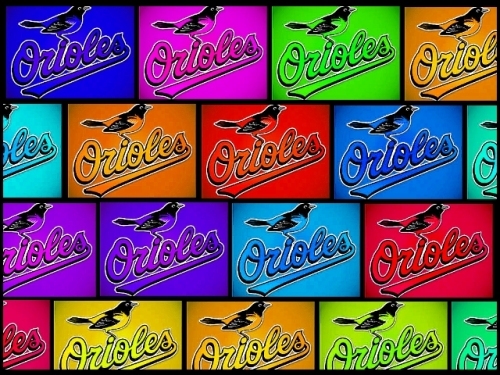 The Orioles experienced their greatest success from 1964–1983, winning seven Division Championships (1969–1971, 1973–1974, 1979 and 1983), six pennants (1966, 1969–1971, 1979 and 1983), three World Championships (1966, 1970 and 1983), and four Most Valuable Player awards (3B Brooks Robinson 1964, OF Frank Robinson 1966, 1B Boog Powell 1970 and SS Cal Ripken Jr. 1983). The first World Series Championship team in 1966 was led by Hall-of-Famers Frank Robinson (OF), Brooks Robinson (3B), and Jim Palmer (P). Frank Robinson won the 1966 World Series MVP award, as well as the Triple Crown in hitting, in which he led the American League in batting average, home runs, and runs batted in. The second World Series Championship team in 1970 was led by the previous trio of Hall-of-Famers, Hall-of-Fame manager Earl Weaver, and 1970 AL MVP Boog Powell (1B). Brooks Robinson won the 1970 World Series MVP award. The third World Championship team was led by Hall-of-Famers Cal Ripken, Jr. (SS), Eddie Murray (1B), Jim Palmer (P) and 1983 World Series MVP Rick Dempsey (C). The Orioles' success after 1983 included the following: Frank Robinson won the American League manager of the year in 1989 managing the Orioles to a second-place finish in the AL East Division only two games behind the Toronto Blue Jays; Cal Ripken Jr. won the American League Most Valuable Player Award in 1991; the Orioles won their first American League Wild Card playoff appearance in 1996 and went wire-to-wire in winning the American League East Division championship in 1997, with Davey Johnson winning the American League Manager of the Year Award. Since the retirement of Cal Ripken Jr. in 2001, the Orioles have been in a downward spiral, compiling a losing record in every season since (Wikipedia).